The end of the world is pretty remote, and getting there is an adventure in itself. With a bit of planning, you can make the journey down here one of the most memorable of your whole trip. Alternatively, there are a few airports that will whisk you down from key cities in Argentina and Chile. How do I get to Tierra del Fuego? There are up to five flights a day from Buenos Aires (AEP) to Ushuaia, taking approximately 3 hours 40 minutes. From Ushuaia airport, it's a short 15 minute drive into the centre of town. El Calafate is the gateway to the Los Glaciares region of Argentina, with its famous Mount Fitz Roy and Perito Moreno Glacier. There are daily flights from El Calafate to Ushuaia, taking 1 hour 15 minutes. When crossing from Argentina into Chile by land you won’t be able to bring any fresh produce - make sure you eat your snacks before you get to the border point! Torres del Paine is in Chile, and it is a 5 hour drive to Punta Arenas, on the edge of Chilean Tierra del Fuego. From here, you can travel to Ushuaia by bus, ferry, or cruise. 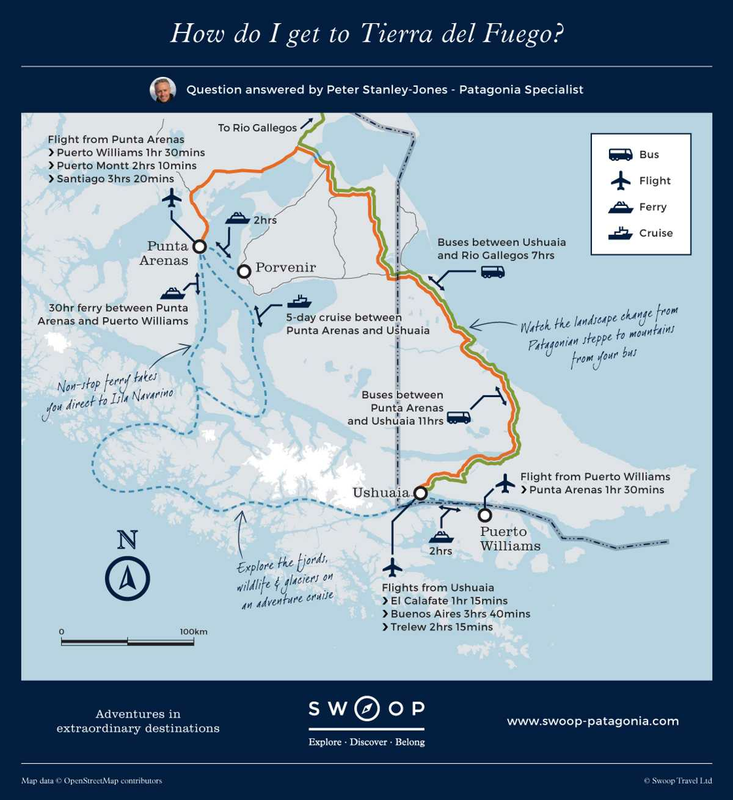 See below for more information on getting there from Punta Arenas. Travelling to Ushuaia from Chile does require a little planning; the vast majority of tourist attractions in Tierra del Fuego are based out of Ushuaia, which is on the Argentinian side. Relations between the two countries have historically been a little frosty, and consequently tourist routes between the two sides of Tierra del Fuego are few and far between. Bus: Departs to Ushuaia nearly every day, taking approximately 11 hours - it's better than it sounds! Cruise: By far the most enjoyable way to travel from Punta Arenas to Ushuaia. By day you'll experience thrilling excursions on small zodiac boats, exploring the Magellan Straits and getting up close to penguin colonies and hanging glaciers. Fly: There are a few flights a week between Punta Arenas and Ushuaia, but they're not recommended. Instead, fly to Puerto Williams on Isla Navarino, from where you can take a short 2 hour ferry to Ushuaia.